Sweet Annie (Artemisia annua): such an unassuming name. Likewise for the plant itself, with its ferny, but not distinctive, foliage, and flowers not worth a second look. You’d hardly peg this plant as a player in global health and global warming. But look within the leaves and you find artemisin, a biologically active compound that has contributed to Sweet Annie’s figuring into Chinese herbal medicine for the past 2,000 years. Artemisin was isolated from the plant in the 1970s by Chinese scientist Tu Youyou, for which she shared a Nobel Prize. Sweet Annie’s uses in Chinese medicine — qinghao in Chinese — run from treating asthma to skin diseases to stomach pain to rheumatism to . . . but not all such claims have been experimentally verified (and Sweet Annie could have bad side effects). The most widespread and thoroughly documented use of Sweet Annie is, in combination with other drugs, in the treatment of malaria, a disease responsible for over a half a million deaths per year. One roadblock to the more widespread use of artemisin is its cost. Which brings us to global warming, or, more specifically, the increasing concentration of carbon dioxide in our atmosphere, which is one cause for global warming. Carbon dioxide, for all its bad press, is one ingredient in the recipe for photosynthesis. The carbon in carbon dioxide is what becomes the organic carbon in a plant’s cellulose, starches, sugars, fats, proteins, and other essential building blocks that store energy and build a plant’s physical structure. More carbon dioxide in the atmosphere could translate into greater growth, although increased temperatures from global warming could have the opposite effect. In the case of Sweet Annie, research by the USDA indicates that a more carbon dioxide rich future would lead to more growth, which translates to greater yields of Sweet Annie and more artemisin for treating malaria. My two Sweet Annie plants aren’t destined for drug production. They’re for olfactory pleasure. Tied into bundles and hung in the mudroom alongside the front door, the bundle will effuse its camphor-sweet aroma each time a breeze or a person brushes past. 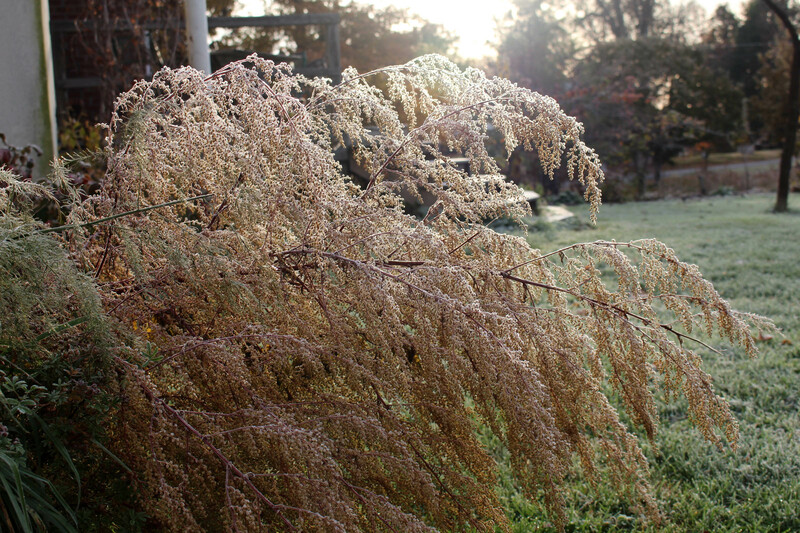 Sweet Annie is a self-seeding annual that, like some other members of the wormwood family, can become weedy. Which makes it perhaps unwise that I planted it where I did. 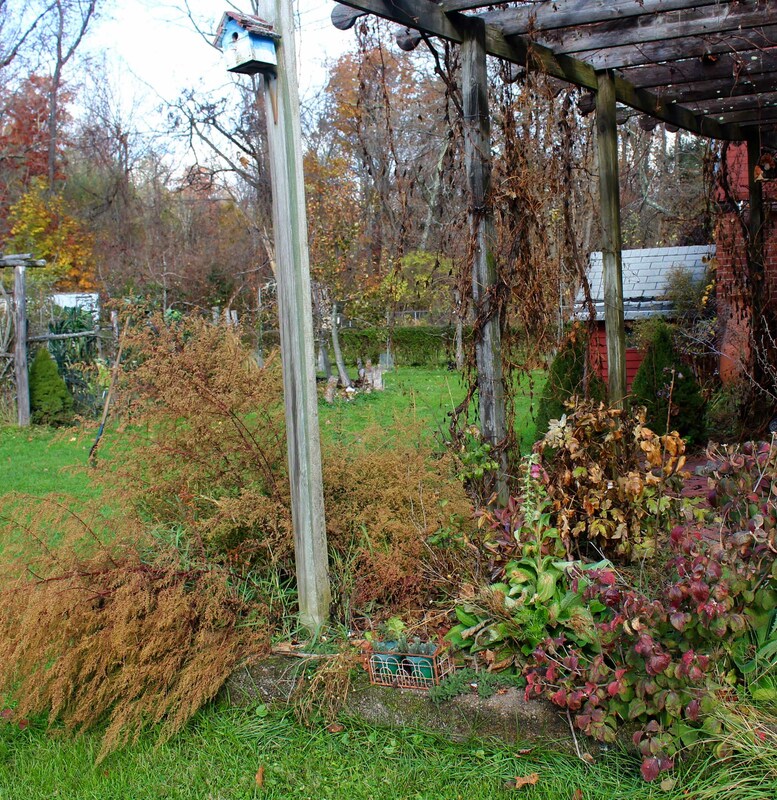 Garden areas closest to my front, back, and side doors are the ones that get most care and that I look at the most; these considerations guide my plantings, both for aesthetics and for pragmatism. Things get wilder as you move further from the house, the most dramatic example of which is the meadow that begins where the lawn ends. So it was perhaps foolish to plant Sweet Annie, which is not much to look at and could become weedy, in the bed next to my terrace. Having the fragrant leaves close by was one rationale. But for some reason, that one bed is cared for the least, perhaps because or perhaps consequently it has become a dumping ground for miscellaneous plants for which there are no obvious homes. That bed is also home to chamomile. Again, one rationale was to have it nearby so I could conveniently pluck flower heads for tea — which I do. But really, no other home presented itself. I planted chamomile there many years ago and got scared of its seeding all over the place. With diligence, I was able to get rid of it — until this year, when I replanted it. I’ve been warned (by myself). I even planted mint in that bed, again, to have it handy for tea, but knowing how it could, and once did, knit the soil, just beneath the surface, with its lacework of stolons from which sprouts new stems. I did have the foresight, this time, to contain the roots by planting the mint into a chimney flue sunk into the ground. Constant attention will be needed to prevent the stems from flopping down over the sides of the flue to root — which they do very easily — where they touch soil. From today’s perspective, a handy little garden overflowing with sweet aromas is appealing. I’ll see how I feel next year at this time. Hanging from vines on the arbor over the terrace are remnants of the season’s grapes and the white paper bags that protected some of the bunches. I found a few bags still with unharvested clusters, frozen but still intact. 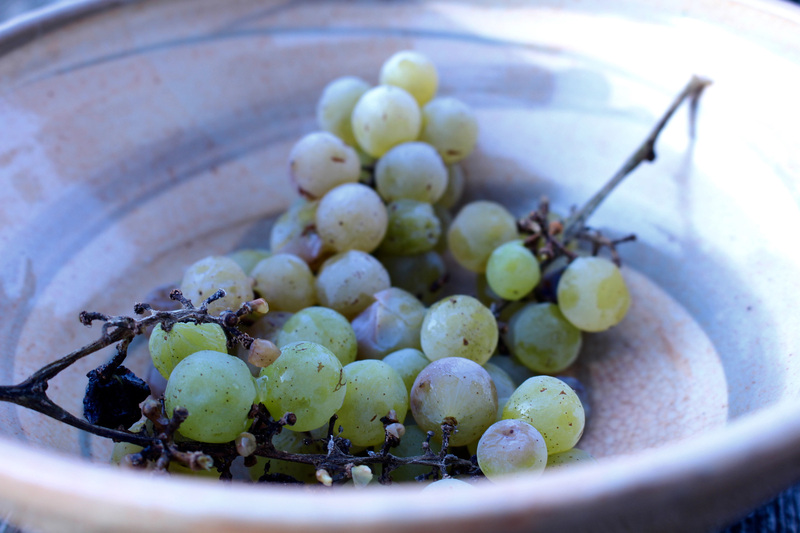 “Ice grapes,” the precursor to “ice wine,” except that these are eating grapes. They were smooth, sweet, and flavorful. This entry was posted in Design, Flowers, Fruit, Gardening and tagged artemesia annua, artemisin, grape, ice wine, invasive, sweet annie. Bookmark the permalink. Trackbacks are closed, but you can post a comment. Learn of it’s root structure. Any clues? Easy to pull out, but it does seed abundantly.